A wild hog has a straight tail. Their tails are never coiled like the tails of a domestic pig. The U.S. Department of Agriculture considers Wisconsin one of 12 states with emerging populations of wild hogs after sustained reports of sightings of feral swine beginning in 2007. Echoing the response of other state wildlife departments with transitional hog populations, the Wisconsin Department of Natural Resources promotes the aggressive statewide removal of wild hogs to prevent these invasive, nonnative mammals from establishing themselves further in the state. Based on sightings or kills reports throughout the state, 17 counties have had verified reports of feral pigs in 2007: Barren, Brown, Crawford, Dane, Eau Claire, Green, Iowa, Jackson Jefferson, Kewaunee, Langlade, Monroe, Manitowoc, Oneida, Rock and St. Croix counties. 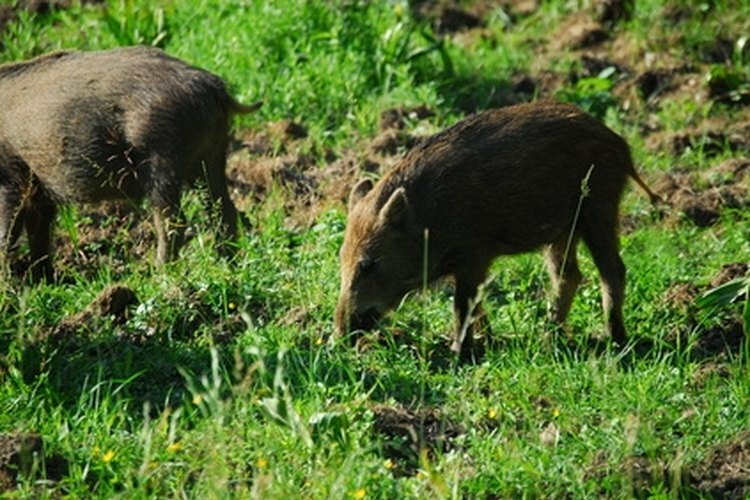 Boars, or wild hogs are at home in a diverse range of environments and prefer to inhabit swamps, woodlands, mountain forests and areas near agricultural fields. Though no definitive explanation exists, the WDNR said it believes like other states with newly present populations of wild hogs that the populations in Wisconsin are the result of unintentional escapes and releases from game farms and domestic pig farms. There is also the possibility that swine have been stocked illegally. WDNR literature refers to its population as feral pigs. Across the United States, wild hogs are referred to as: wild boars, Russian boars, feral pigs, feral swine and feral hogs. The terms feral pigs, swine and hogs are more closely associated with hybrid species of wild and domestic pigs. Wisconsin wild hogs closely resemble domestic swine. Wild hogs exhibit great variation in color and pattern though, in Wisconsin, most feral swine that have been sighted or harvested have been black. Hunters note: Wild boars like to feed at dusk or dawn and usually spend the rest of the day in cooler vegetation or wallowing around mud banks. Hunters in Wisconsin who possess a valid small game license may harvest wild hogs at any time throughout the year. There is no bag limit. Sportsman hunting on private or posted land should always obtain permission from the landowner before engaging in any hunting activities. Hunters should observe all regulations for any season that may be in progress including though not limited to hunter’s orange requirements, bans on night hunting and firearm laws. As part of the WDNR's animal nuisance control authority, any landowner may shoot wild hogs without a hunting license provided it is on their own property. It is unlawful to operate a feral pig hunting preserves or to release hogs into the wild in the state of Wisconsin. Wild hogs pose a significant threat to the environment, agricultural operations and human quality of life, and Wisconsin is particularly vulnerable to these invasive mammals because of its large agrarian infrastructure. Rooting pigs use their acute sense of smell to sniff out roots, tubers and small animals and raze soil with 3- to 5-inch tusks. This foraging technique degrades natural habitat and destroys crops and has resulted in conservatively $800 million in damages nationwide. Domestic pigs are known carriers of at least 30 serious diseases most of which can be spread to livestock and several that are transmittable to humans. It should be noted that all harvested or sampled Wisconsin wild hogs have been disease free. Aaron Samsel is the founding editor of Guns.com. He has been writing professionally since 2008.